People have always had a fascination with pearls. Early in our history, pearls were treasured and regarded as symbols of wealth and power. Pearls—and their modern counter-parts, cultured pearls—occur in a wide variety of colors. Perhaps the most familiar colors are white and cream, along with black and gray, but pearl colors can extend to virtually every hue. The body color of a pearl is often modified by additional colors called overtones, which are typically pink (called rosé), green, purple, or blue. Some pearls show the iridescent phenomenon known as orient. Ancient civilizations were mystified as to where pearls came from. In China, it was believed that the pearl formed in the brain of a dragon. Ancient Greeks favored the idea that pearls were formed by lightning striking the ocean. The spherical shape of some pearls led many cultures to associate this gem with the moon. In Europe, they symbolized modesty, chastity, and purity. For more than 100 years, discoveries in pearl culturing have revolutionized the market and essentially replaced natural pearls in jewelry. A natural pearl occurs when an irritant, such as a parasite, works its way into a particular species of oyster, mussel or clam. In defense, the mollusk secretes fluid, called nacre, to coat the irritation. Over time, layers of nacre form natural pearl. In cultured pearls, the irritant is a surgically implanted bead or bit of shell. Pearl—natural or cultured—is a U.S. birthstone for June. Natural pearls are organic gems that form inside the shells of certain mollusks, usually around a microscopic irritant, without any kind of human help. They are mostly made of concentric layers of nacre, which is the same basic material as the inside layer of certain shells. Natural pearls were once more numerous—and prized by almost all cultures. Today, natural pearls have virtually disappeared from the mainstream jewelry market, due to over-fishing, pollution, and economic factors. Fine natural pearls can command very high prices. in 2007, a natural pearl necklace sold for $7.09 million at a Christie’s auction in New York. Cultured pearls are formed with the help of humans. To make a pearl, a skilled technician inserts one or more nuclei (usually shell beads and/or pieces of flesh from other mollusks) into a mollusk. The mollusk is then returned to the water where the nuclei act as irritants and trigger the mollusk to secret nacre around the nucleus. Pearls are generally harvested after 18 months to 3 years after nucleation. Experiments with pearl culturing began hundreds of years ago in China, and Japanese pioneers successfully produced round cultured pearls around the beginning of the twentieth century. After the 1930s, pearl culturing diversified and slowly spread to various countries around the world. A trained gemologist can often identify cultured pearls. Positive identification of natural pearls requires advanced laboratory testing. Different types of cultured pearls and pearl terms include akoya, South Sea, Tahitian, freshwater, mabé, blister pearl, and keshi. Pearls have a hardness of 2½ to 4 on the Mohs scale, which means they are very soft and easily scratched. They usually have good toughness, but this can be variable due to aging, dehydration, and sometimes excessive bleaching during the initial processing. High heat can burn cultured pearls, or cause discoloration, splitting or cracking. Pearls are generally stable to light but heat from intense light can cause dehydration and nacre cracking. Pearls are attacked by many chemicals and all acids. Hair spray, perfume, cosmetics, and even perspiration can damage nacre. 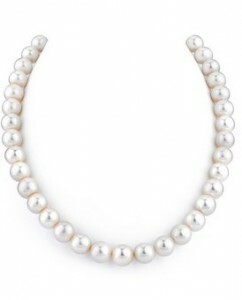 Pearls should never be cleaned in an ultrasonic or steam cleaner. Warm, soapy water is safe for an occasional cleaning, but if the pearls are strung, be sure the string is completely dry before wearing the pearls. For routine care, pearls should be wiped with a very soft clean cloth after each wearing. Pearl imitations can be made from glass or plastic.